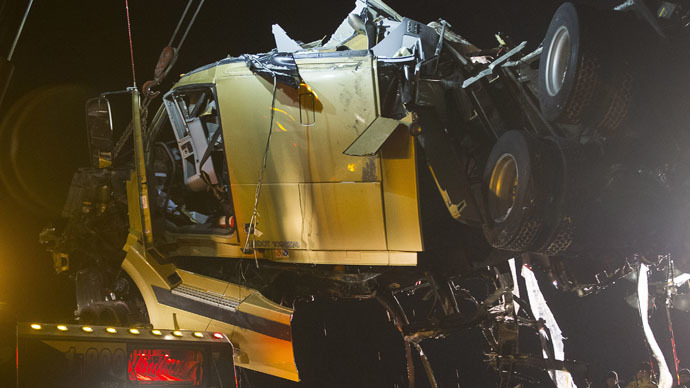 A huge collision overnight in bad weather on highway 401 near Trenton, in southern Ontario has seen trucks written off and 40,000 liters of oil spilled but amazingly only four people have been taken to hospital with non-life threatening injuries. The crash happened on the eastbound lanes of highway 401 at around 12:08 local time, according to the Ontario Provisional Police. More than 50 people involved in the pile up were taken to a nearby hotel to spend the night. Up to 33 trucks and their trailers were involved, according to one eyewitness, with one tanker spilling 40,000 liters of oil all over the road. James Dawson, a lorry driver who managed to stop his vehicle safely, told CBC News Toronto that the carriageway was covered in hard-packed snow and ice with blizzard conditions appearing out of nowhere. “It’s a mess down here, it’s crazy,” he said. Adding that he was amazed nobody had been killed. “Trailers are chopped in half,” he said. Police have been forced to close the 401 between junctions County Rd. 30 and Walbridge Loyalist Rd. Dawson said he and other drivers did not expect 401 to fully open again until Wednesday night, although one westbound lane has since been reopened. “It is going to take a while. It is quite a mess and quite a situation but number one is that no one was really hurt seriously and number two is that there were no fires and people were removed quickly and looked after. We got things in place very quickly and everybody responded and worked well together,” Major Jim Harrison told CP24, a Toronto news channel, on Wednesday morning.